I’ve never pickled anything until today. When I was growing up, for several years Mom and Dad pickled things, mainly cucumbers. I remember our kiddie swimming pool being used to wash vast quantities of cucumbers, large boiling cauldrons on the stove-top, the word “sterilized” being thrown around and soft curses being muttered as jars cracked. It was a Production and my sister and I were usually sent to play far away. The Parents didn’t care where. Just get out of the kitchen. As an adult, it seemed like too much fuss and bother. Why pickle pickles? You can buy them in a store. Besides, I don’t like pickles. Traditional pickles. Cucumber-type of pickles. I’ve tried. I bought every brand ever made, tried everyones homemade variety, and still, I find them difficult to like. But, I do like other things that are pickled. I love pickled beets, asparagus, onions, Branston pickle, and all chutneys. In a previous post I declared my love for the Vietnamese sandwich, and discovered one of the ingredients is pickled carrots. Today I was doing myself some grocery shopping, and as I’m on a Health Kick (she says as she swigs her beer), I needed to buy some veggies. I spotted the bag of match-stick cut carrots, and thought “I could pickle those”. And so the challenge was on. Boil the above and remove from heat. 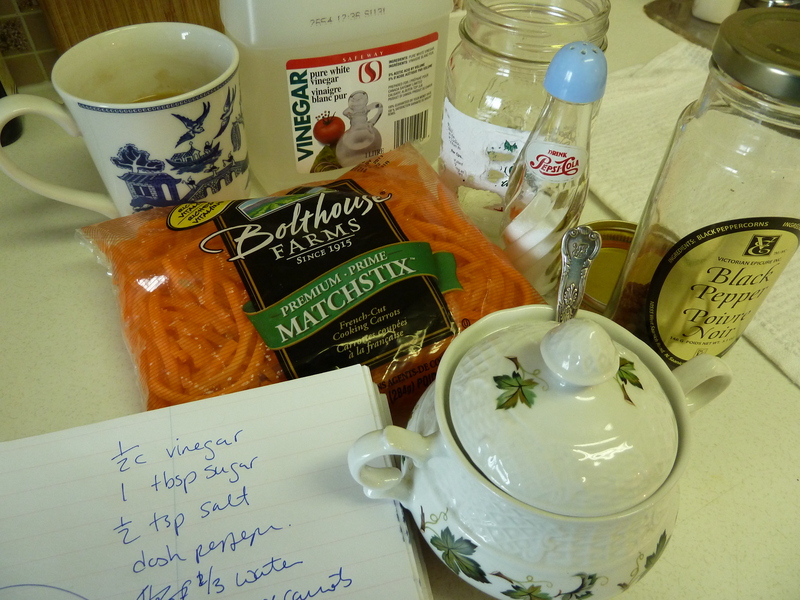 Then, to a sterilized jar, fill with carrots, add the brine. Screw on the top, and sit patiently and wait for the lid to make that popping noise it makes when the jar is sealed properly. I don’t know how I know that, but I must have learned that somewhere or another. 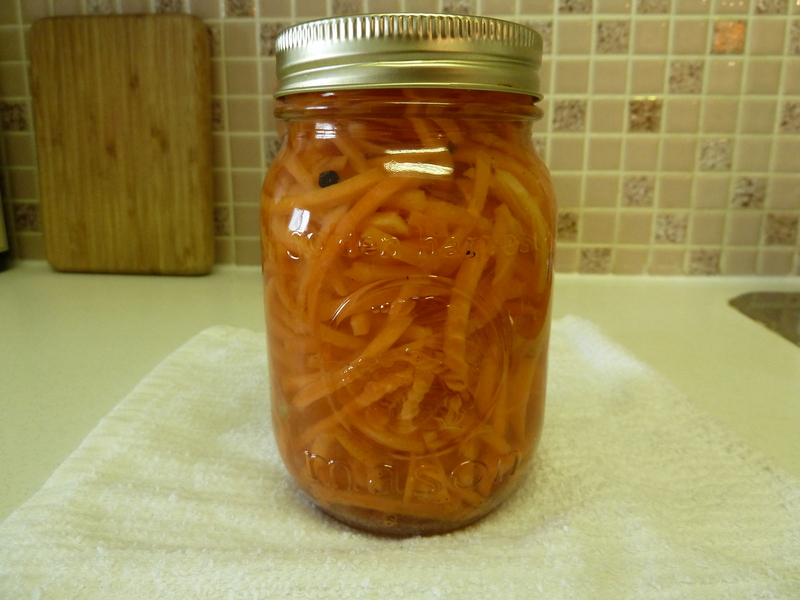 Now, I am leaving the jar to cool on the counter-top, and will not open the jar until tomorrow evening. Almost every recipe I read says you Must Not Eat The Carrots until 12 hours have passed. So, to find out if they worked, you will have to check Twitter tomorrow night. If you don’t hear from me, I’ll probably be at the Royal Alex being treated for food poisoning because I didn’t sterilize the jar properly. You pickled bought carrots. Interesting, very interesting. Hush. I’ve got to keep one foot in our high-paced high-tech world, and one in an era of wood stoves and water pumps. If some machine has been invented to match-stick cut carrots, I will buy them. Call it compromise. Have you ever read Carol Shields’ novel, Larry’s Party? It features an unfortunate death by bad canning. Just FYI. My husband would like these. He likes pickled eggs. He’s a funny man 🙂 Now that you’ve managed to pickle my curiosity, I may have to just try these out meself. Funny,I just pickled rhubarb today. I’m waiting for my lid to pop as I type! Let me try them first. After Debra’s message above, I’m nervous to try them! HA HA. Pickled rhubarb! Is it like a chutney then? What would you eat it with? It appears to be like cucumber pickles at first glance but I suspect things will soften up as time goes on. I haven’t tasted the end result yet but I plan to have my first taste with some chedder cheese and..crackers or something. Ha, who am I kidding, I’ll be eating it out of the jar! I’d imagine it’d be good with fish or chicken too..
At first glance its like a cuke pickle but I suspect it’ll soften up as time goes on. The recipe is on my blog. I’ll probably eat it out of the jar but I’d imagine one could eat it with fishor chicken, or on crackers/bread with cheese or in a salad..
I’ve pickled carrots many times! Not exactly like this, but similar! They’re delicious, good luck with these!! I think I might try rhubarb next…. PS: I love your blog, you crack me up. Thank you Erin! So happy you left a comment. Hope to see you around.